In its historic judgment delivered by the Supreme Court in Sri Lanka short awhile ago has ruled out the President Maithripala Sirisena’s dissolving the Parliament and calling for a snap poll is illegal and unconstitutional. The president's United People’s Freedom Alliance (UPFA) had earlier on Friday, 26 October, quit the national unity government that had governed with Prime Minister Ranil Wickremesinghe's UNP. Later at about 7:00 pm without a prior announcement, President Maithripala Sirisena unexpectedly appointed former President Mahinda Rajapaksa as Prime Minister in a live swearing-in ceremony broadcast over television. Rajapaksa took an oath of office in the presence of Sirisena and representatives of the military inside the Presidential Secretariat. He was sworn in while Prime Minister Ranil Wickremesinghe was still the incumbent and away touring in the south of the country. However, on 12 November, twelve Fundamental Right petitions were submitted to the Supreme Court of Sri Lanka challenging the president's decree sacking parliament and calling a snap election, by the UNP, TNA, JVP, SLMC and others including Prof Ratnajeevan Hoole, a member of the ElectionCommission. 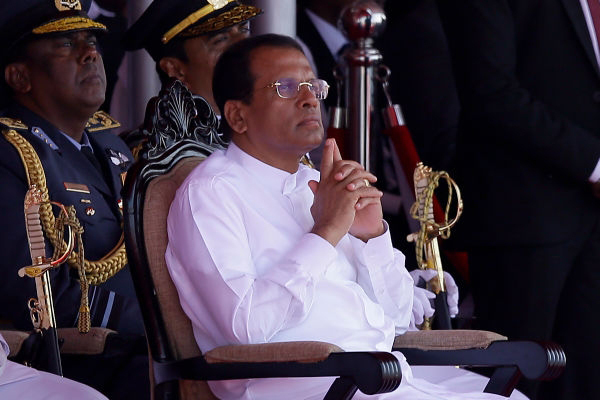 Arguing that Sirisena's actions were unconstitutional, illegal and against the people of Sri Lanka, Hoole demanded the restoration of status quo prevailing prior to 26 October. Hoole's position strengthens the argument of 11other petitions. The Bench Comprises Chief Justice Nalin Perera, Justices Buwaneka Aluwihare, Sisira J. de Abrew, Priyantha Jayawardena, Prasanna S. Jayawardena, Vijith K. Malalgoda and Murdu Fernando.